HostGator.com LLC claims to be the world leading provider of shared web hosting, reseller hosting, vps hosting and dedicated web hosting services. Privately held and based in Houston, Texas, the company was founded in 2002 by current President and CEO Brent Oxley, who started the company from his dorm room at Florida Atlantic University. Since then, Host Gator has grown from a small hosting company with just three servers into one of the world leading and industry recognized hosting providers with more than 12,000 servers under management. According to their site, Hostgator hosts over two million domains that makes up approximately 1% of the world’s Internet traffic. HostGator utilize The Planet network and world-class data centers that feature state of the art security, power, safety, and cooling systems. HostGator houses servers in four of The Planet’s Dallas, Texas-area data centers. Ranging from 22,000 to more than 78,000 square feet, these world-class datacenters contain top of the line technology to ensure that servers stay cool, secure, and up at all times. The data centers feature redundant power, HVAC, and fire detection systems, and are monitored 24/7 by both HostGator and The Planet’s NOCs. There are also more expensive managed VPS hosting plans by Host Gator, as well as low cost managed dedicated hosting with Linux or Windows OS and FREE cPanel (or Plesk) control panel starting from just $179 per month. * HostGator provides ECO-friendly green web hosting service – learn more. » Found it useful? - Share it! Below you can read HostGator reviews submitted by our site visitors who were (or used to be) HostGator customers at the time of writing the review. I’ve been using Hostgator for my blog (spogmai.net) and it simply is the best. Especially the prompt Customer Service they offer which is second to none. I have been with Hostgator for over 4 years now having moved from many different hosts before finding the right one, Hostgator. I have never had such a fantastic service from any company anywhere! Hostgator are simply the best you will find, the customer service is amazing, 24/7 and they help with all kinds of advice, even when it isnt server related. They have techs working for them that actually care for the customers and this has been proven time and time again when I had issues with scripts, even though it wasnt up to Hostgator to fix these issues, they gave me great advice to get the scripts working. I have a dedicated pro server, fully managed and a level 4 VPS, both are perfect for my entire business and I have a lot of sites! Anyway, Hostgator are simply the best hosting company out there and that is the reason why they are so popular, if you are searching for a hosting company, you dont need to, just go to Hostgator! I recommend to take service from Hostgator, it gives you everything for a website and the charge is nominal. They providing attractive offers to all the web hosting people. Hostgator technical support, sales and services are extremely good. One valid opinion is they are not supporting illegal activity like pirated license product etc. I am having the reseller account with them, I have never faced the issue like site down, loading issue, backup failure. My team are happy with their service and also we plan to book shared hosting with them. I have been a Host Gator customer since 2010 and I find it the best hosting service provider for all my linux hosting needs. I find the support offered by Host Gator through the chat and support ticket are best in the industry. I never had the need to educate them about the issues and the team is technically very sound. The cool whm/cpanel/WHMCS combination is super and I could completely brand my business with ease. I remember contacting them for setting up private name servers in the beginning which they could have integrated with the account signup (But it was just a 1 time trouble). I personally feel, one should and must have a hostgator account if he is in need of linux hosting solutions. I have also taken a VPS for one of my customers and the performance of the same is very good. Support is equally good. My 4.5 out of 5 for hostgator. I have been using Hostgator since early 2008, with one of their reseller packages. I have hosted many sites and have rarely encountered any issues with their hosting. In the last 4 years I’ve only had to contact them twice for any issue. When ever I did have an issue, their support staff was very friendly and professional. I didnt have to wait for a long time, which to me is worth a lot!, and could do it all through their chat system. I have used many other hosting companies, and Hostgator is without a doubt the easiest to use. They keep their software up to date, so you know you will have latest in cPanel and WHM. The funny thing is, I never realized how important that was until I signed up for an additional hosting company which didn’t do this. Hostgator also is competitively priced as well. They may be a little more then the smaller hosting companies, but you get what you pay for. In my opinion, Hostgator is worth every penny and will always be keeping my account open and active with them. I remember contacting them for setting up private name servers in the beginning which they could have integrated with the account signup (But it was just a 1 time trouble). I started looking for a real hosting company back in 2010 because I had problems with free hosting. I decided to go with HostGator to host my blog onlinemoneybuzz.com. I chose the baby plan that allowed me to host unlimited domains because I had several other sites that needed hosting. The price of the plan was and still is very reasonable. If you consider everything you get plus the excellent customer support, you are getting a really great deal. You get reliable hosting and tons of extras. I also found it very easy to use CPanel and install content management systems like WordPress. I’ve been with HostGator the whole time and never thought about switching to another company. I have seen plans that are cheaper elsewhere but I am very satisfied with HostGator and don’t mind paying a few dollars extra each month to get superb web hosting from them. I am able to host all of my websites and I don’t have to worry about my sites being down. I think my sites have only been down two or three times over the course of 2 years with them and each time, they were back up in no time. I would recommend them to anyone looking for reliable web hosting. It’s been few years since when I started creating websites and sharing my contents with the world through them. Since the first time I started uploading stuff it was Hostgator which became the 1st choice for my hosting. I use the Baby plan where they offer you unlimited space, bandwidth and domains as a package of their shared hosting services for high traffic sites such as thankfulformyhealing.com. The experience of their services has been great where I have hardly faced issues troubling access to my website. Be it the speed of the website upload, or tools for updating my sites and maintaining them all have been exceptional. To add to that every time I required their assistance the online help had been very kind to take care of all the issues within a few hours. One instance which I would like to mention is when I had problems with taking backups due to the over consumption of the allotted innodes. I just went to the helpline and an half an hour chat with some formalities here and there was all I had to do to get it fixed. So as a personal recommendation for all those of you who wish to start off with several websites and search for a reliable webhost then Hostgator is the right choice. Hostgator is an excellent service provider offer quality web hosting services. I also availed their Email hosting facility and my mailing system works extremely well. Moreover, the customer support they offer is also prompt & brisk. This is the major reason why I’m not hunting for any other web hosting services company. Great Work and Excellent Services by Host Gator. Its a shame, cause there is good here, better than average. But I am back looking at go daddy (which makes me wretch). Sigh. Hostgator baby plan is the best option for those who just want to Domain Flipping Business, as it provides unlimited Disk space, unlimited Bandwidth and unlimited Domains under one plan. Those who only want to sell and buy domain names they should consider the Hostgator Baby plan. Thanks Hostgator for providing us with such a great opportunity. HostGator has hosted some 25 of our websites and we could not be any happier. They provide quality and they know what they are doing. Other hosting companies always have excuses and problems. 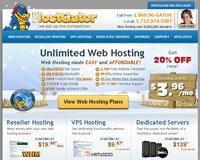 Hostgator, to me, is the best web hosting company out there. Their server was never down and their customer service is top notch. I never had issues with them since I started using them 5 years ago. I was having problems with the previous host I was using because they(my previous host) had cheaper plans than Hostgator. In other words, I went for quantity and not quality. However, I later realized my fooly and went straight to Hostgator. Since I migrated, I have never experienced any problems so far. I have not once had any downtime with hostgator. Every question I have had were answered quickly. I have recommended my friends to them and they have all been happy with Hostgator. When I switched to my main income source of business being online, I put my faith into Hostgator. I have been quite pleased with them. Reliability: I work from home, and it is super important to have 100% uptime. Hostgator does some great uptime for me. Price: You can get the first month hatchling plan for a penny (see Hostgator coupons), and then it costs only around $7 per month. Tools: They give you a lot of tools in the dashboard. You won’t need half of them.. but still all those tools are nice to have just in case. I was also using hostgator web hosting for my blog for 5 years and now I have stopped the blog writing and shifted my blog to blogger. Hostgator gave me best service and I am very much pleased with their online chating service which resolves all our hosting problem at once.